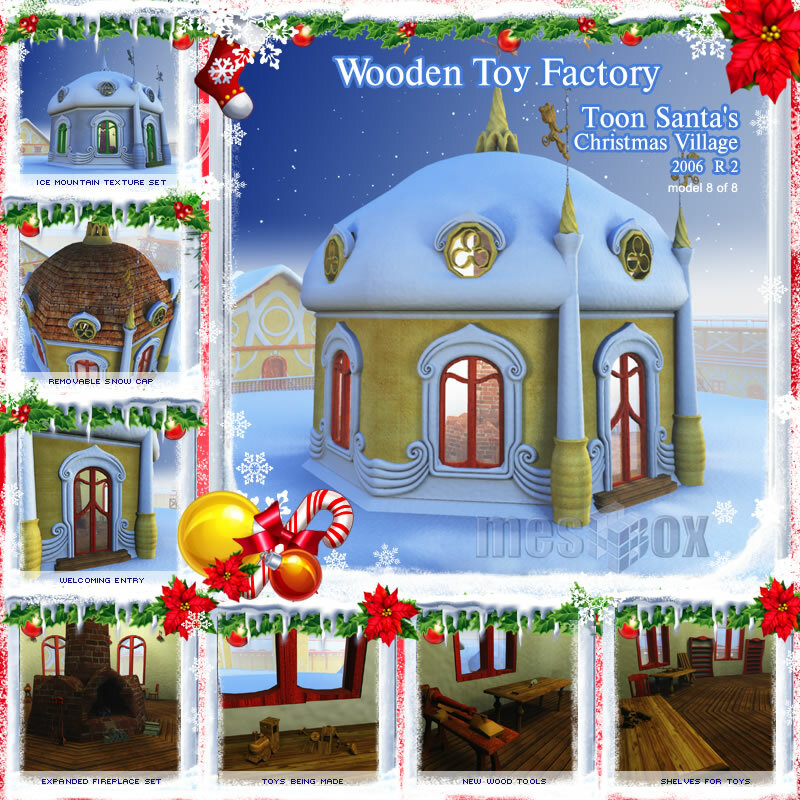 Toon Santa's Christmas Village 2006 R2 is a set of eight beautiful 3D Christmas holiday models from Meshbox Design. The Christmas Village series is an annual release product event, beginning in 2006, adding additional models to the growing North Pole village of Toon Santa. This model set includes eight complete models - seven publicly released versions plus an eighth model only available in the Complete Edition. 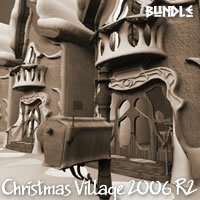 First released for Christmas year 2006, this model set is revised and updated to the R2 standard. The fashionable footware of Santa's North Pole Christmas village is - the black boot. 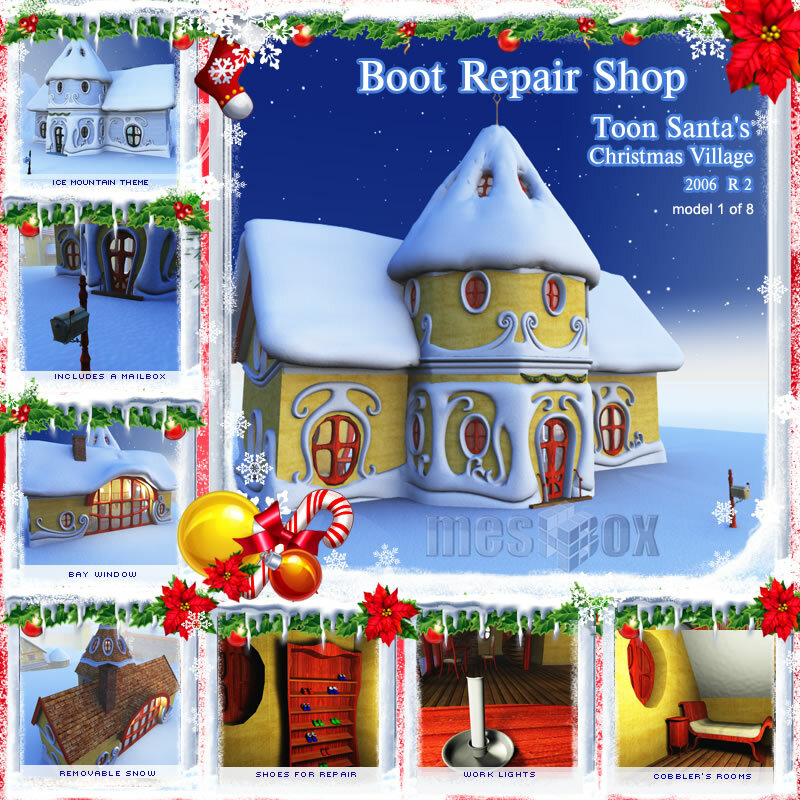 Toon Santa and his helpers make regular visits to the Boot Repair Shop to ensure their boots stay warm and shiny black. The shop includes a large work room and waiting area, plus living quarters for the bootmaster and his apprentices. Some industrious engineer elves have to keep Santa's sleigh in top condition. 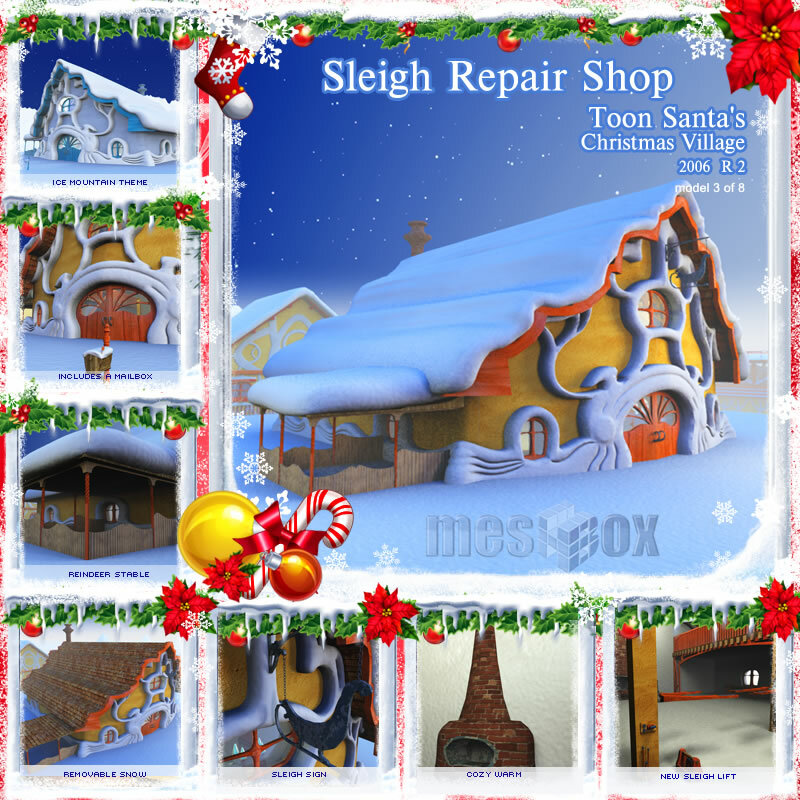 Toon Santa brings his sleigh to the North Pole Sleigh Repair Shop. A small but sturdy corral is attached so that the younger reindeer don't stray while the sleigh is in the shop. Features removable roof snow cap. Some industrious engineer elves have to keep Santa's sleigh in top condition. 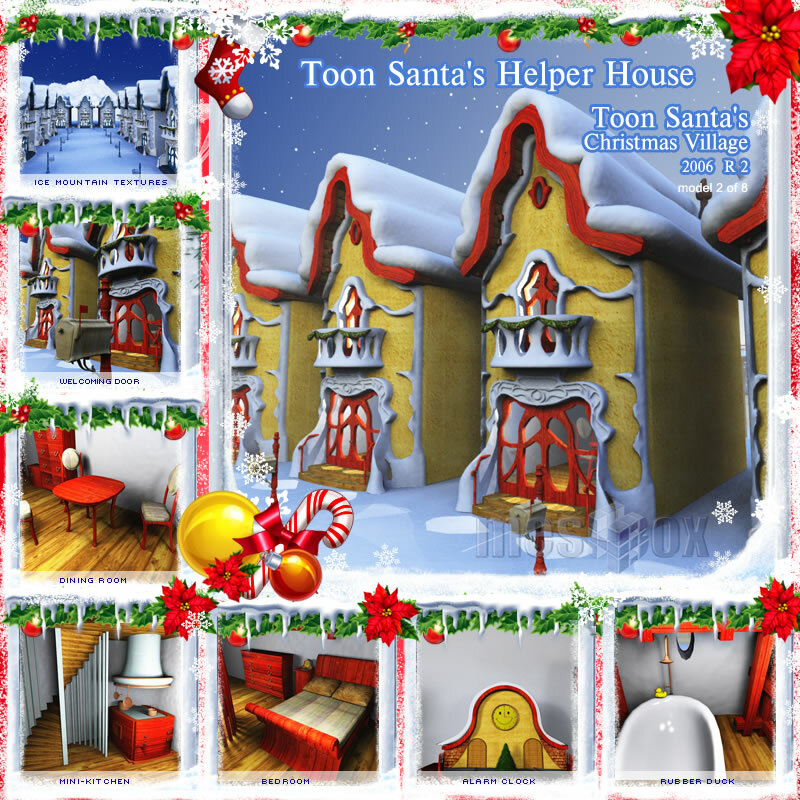 Toon Satna brings his sleigh to the North Pole Sleigh Repair Shop. A small but sturdy corral is attached so that the younger reindeer don't stray while the sleigh is in the shop. Toon Santa's Candy Shop creates wonderful hard candies and serves as a hot spot for work breaks for hard working elves - and sometimes Santa himself! The merry gents enjoy a rest and a hot chocolate, often with a hard candy melted within! Features removable roof snow cap. 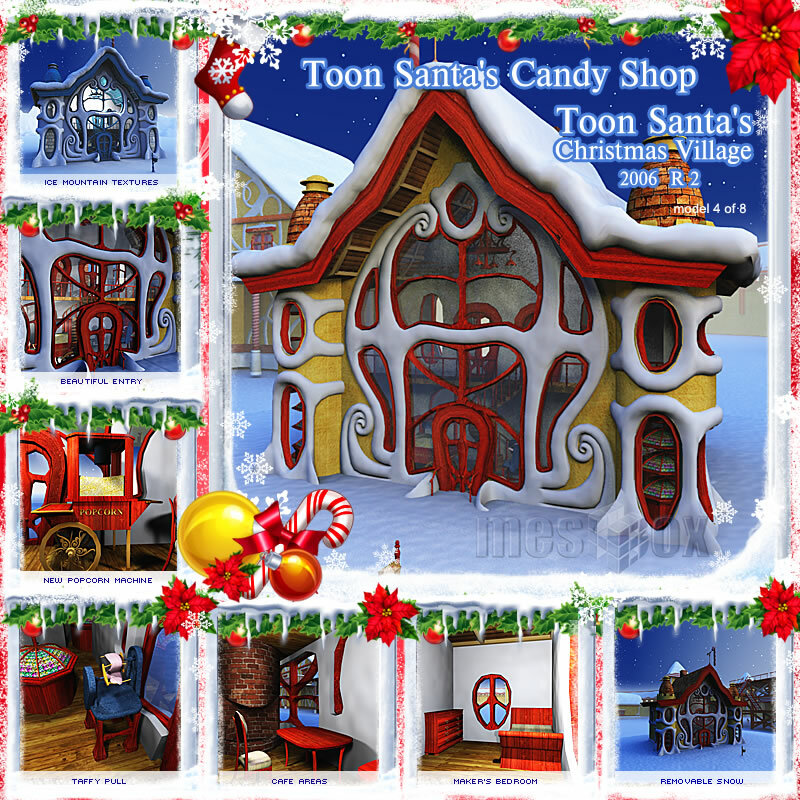 Toon Santa's candy shop creates wonderful hard candies and serves as a hot spot for work breaks for hard working elves - and sometimes Santa himself! The merry gents enjoy a rest and a hot chocolate, often with a hard candy melted within! 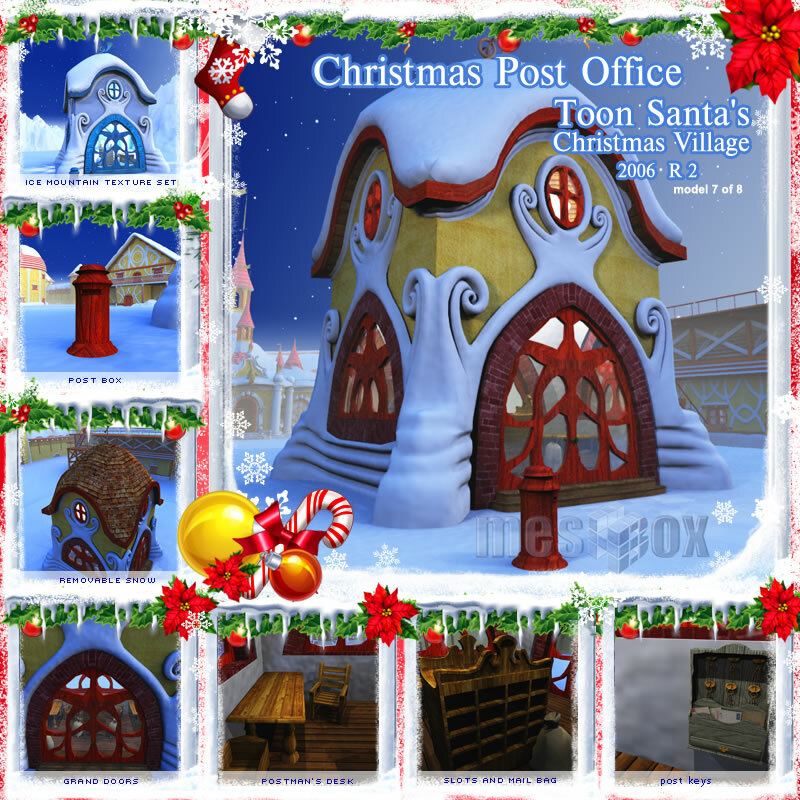 Near the center of North Pole Village is Toon Santa's Ice Rink - a place for fun, music and sometimes-first love among the elves! Many an elf couple have shared laughs and cups of hot chocolate from the sidelines. And at the center is a beautiful village christmas tree. 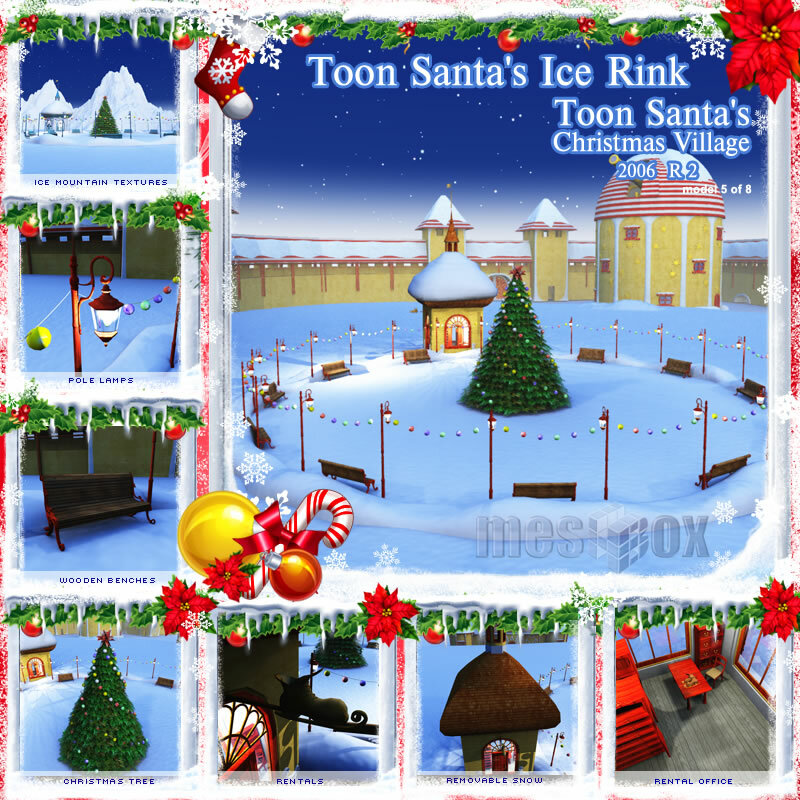 Near the center of North Pole Village is Toon Santa's Ice Rink - a place for fun, music and sometimesfirst love among the elves! Many an elf couple have shared laughs and cups of hot chocolate from the sidelines. And at the center is a beautiful village christmas tree. A constant stream of customers visit the North Pole's Ornament Shop, where Christmas ornaments are created at breakneck speed! Just send a herd of reindeer through the center of town and you'll soon hear the pop, pop pop of broken ornaments! A constant stream of customers visit the North Pole's Ornament Shop, where Christmas ornaments are created at breakneck speed! Just send a herd of reindeer through the center of town and you'll soon hear the pop, pop pop of broken ornaments! Despite the popularity of electronics, the wooden toy factory creates magical wonders for children around the world. At one station, a monkey is made, at another, a train! Central heating keeps elves happy. Features a pop off snow cap on the roof. Despite the popularity of electronics, the wooden toy factory creates magical wonders for children around the world. At one station, a monkey is made, at another, a train! Central heating keeps elves happy. Features a -pop off- snow cap on the roof. This model is the bonus model and not sold separately.